Most of the enterprises are trying to cope up with increasing scale and speed of consumer / business applications. IT teams are under constant pressure to deliver software & applications faster, on time and without fail. Nobody wants to wait 2-4 weeks to provision a server. One of the primary struggles of enterprise data centers today is to provide agility required by modern applications. On the other hand, agility is one of the primary motivations to use public cloud providers such as Amazon, Microsoft and Google. The very reason these providers can support faster turnaround and flexibility lies in the difference in underlying architecture. Public cloud architecture are governed by 3 key principles: 1. scale horizontally 2. use shared-nothing principle 3. asynchronous communications. Monitoring is core to everything inside these clouds and applications are by default hardware fault tolerant, i.e., a software layer provides a protection against individual hardware failures. Many enterprises have a number of on premise data centers that they aren’t ready to retire yet. These enterprises want to leverage benefits of these public cloud architectures, their preference remains be on-premise for majority of applications. They are not ready to move all of their operations into public cloud. Private cloud could be a great option here. However, building a private cloud requires careful consideration of server platforms, storage, hardware and operational tools & processes. Other factors such as cost, skilled manpower, data center location, network redundancy, adequate power and cooling, and appropriate physical security are also very important factors. Clearly, building a private cloud is not easy – it is lot of energy and money. To find a balance between public and private cloud, many enterprises are also exploring options to build hybrid clouds to modernize their infrastructure – there are looking for ability to use those on premise data centers easily with public clouds. While AWS do not have any on-premise system (however, it accepts hybrid clouds as consumer choice), Azure clearly has an edge forward with the launch of Azure Cloud In a Box. With its new Cloud Platform System (CPS), Microsoft is attempting to differentiate itself vs. rivals Amazon Web Services and Google. 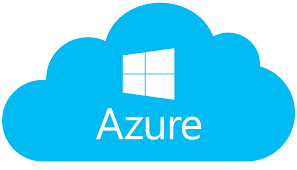 The Azure Cloud in a Box offering uses the same software that powers Microsoft’s Azure public cloud – the HyperV hypervisor, Windows Systems Center and Azure Pack – and runs on hardware supplied by Dell (for now and Microsoft indicates to have more hardware partners soon). With Dell as its hardware partner, Microsoft will offer customers pre-assembled racks of servers running Windows Server 2012 R2, System Center 2012 R2 and Windows Azure Pack. 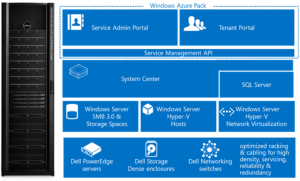 Azure Pack, originally known as “Windows Azure Services for Windows Server,” is a collection of Microsoft Azure technologies available to Microsoft customers at no additional cost. 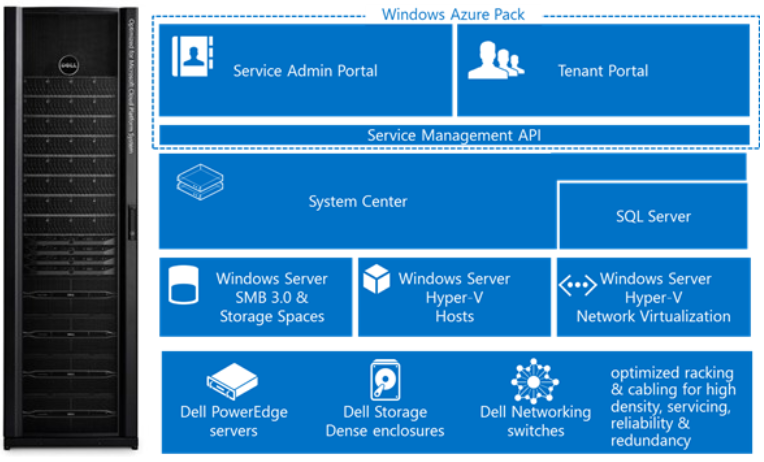 Once installed in your datacenter, the Windows Azure Pack integrates with System Center and Windows Server to help provide a self-service portal for managing services such as websites, Virtual Machines, and Service Bus; a portal for administrators to manage resource clouds; scalable web hosting; and more. CPS uses software familiar components (Windows Server 2012 R2, System Center 2012 R2 and Windows Azure Pack), so there is no retooling needed to operate CPS. It comes with integrated anti-virus, fabric based backup for all VM’s, disaster recovery, orchestrated patching, monitoring, an Azure-consistent self-service portal (Windows Azure Pack) for tenants, REST-based API for programmatic interaction and automation using PowerShell. CPS also provides PaaS services such as “Websites” and Database-as-a-service. There are no additional components to buy. It is a complete cloud solution. “A core element of this design is the work we put into failure mode analysis. One constant that we recognize when operating at scale is that failures will happen. And yet business-critical services cannot be impacted by these failures. The CPS system architecture includes redundancy in the physical infrastructure as well as intelligence in the software that makes the solution resilient to failures”. From a capacity and scale point of view, Microsoft explained that a single rack can support up to 2000 VM’s (2 vCPU, 1.75 GB RAM, and 50 GB disk). You can scale up to 8000 VM’s using a full stamp with four of these racks. 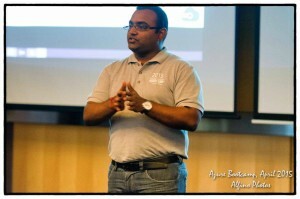 There is also flexibility of choosing VM dimensions. This definitely is a good solution to explore Hybrid cloud in a controlled environment. A lot of adoption would depend on the pricing and availability – the blog post also points that more details on this will be made public in coming months and I am hopeful it will pave new ways for organizations to modernize their infrastructure quickly and with ease.